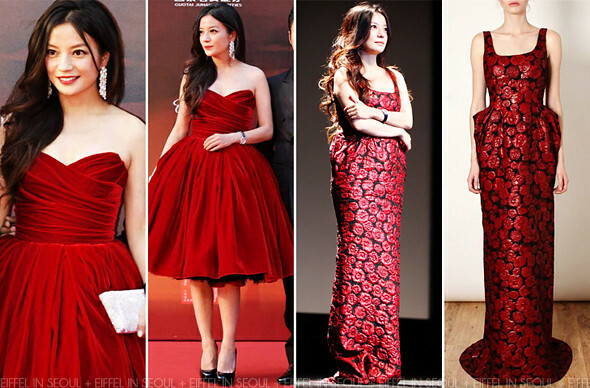 Chinese actress, Zhao Wei (赵薇) walked the red carpet of 15th Shanghai International Film Festival on June 16, 2012. Her red velvet Dolce & Gabbana strapless dress is styled with a pair of black pumps and stunning silver jewels. At the press conference held later that evening, she changed into a red rose brocade gown from Lanvin. Wavy curls and simple accessories to complete her look. I absolutely adore the Dolce & Gabbana dress on her, she looked flawless. I do wish she wore the Lanvin gown on the red carpet instead.